Our collaboration with TGI Fridays began in 2001, when we were charged with refurbishing existing branches across the country. Since then, we’ve become a regular service provider, fitting out new branches of the restaurant and introducing the company’s new visual identity at their Newcastle restaurant and bar. 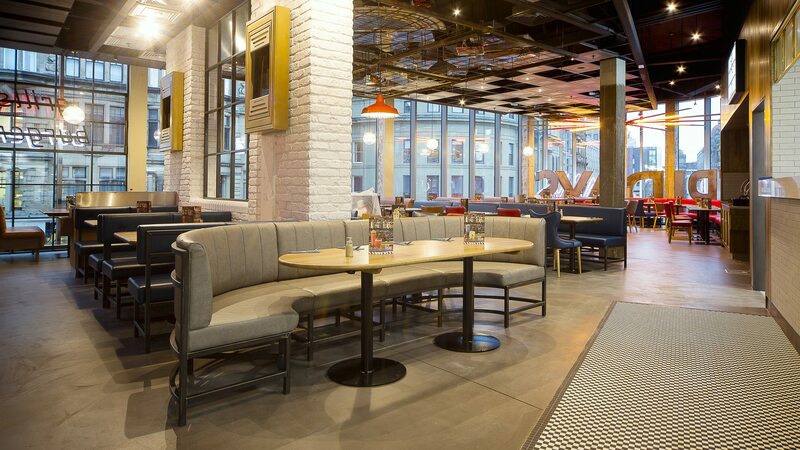 Speed and quality of delivery are the key to our work for TGI Fridays - our team carries out complete restaurant fit outs in a short space of time, creating commercial kitchens, bars, and bespoke seating and furniture, all in line with the brand’s distinctive and carefully crafted style. TGI Fridays has decided to update the interior styling of its restaurants with a streamlined and more contemporary design. We had the pleasure of undertaking a turnkey fit out at the new-look Newcastle branch on Eldon Square. The Newcastle branch of TGI Fridays comprises three distinct seating areas: the main restaurant, the bar, and the lounge, helping to cater for both day and evening clientele, whether they’re having a meal or stopping in for a drink. We created an energy-saving kitchen, filled with the latest low energy cooking technology, and integrated this with carefully planned servery systems to help staff meet the high demand of orders, and serve customers quickly and effectively. A mix of leather banquette seating, free-standing dining chairs, and retro bar stools offers customers a variety of seating options, while pale wooden table tops complement the new, lighter style of the restaurant’s interior.